Think twice before ordering that combo. Many people want information on fast food nutrition facts before they pull through that drive-through. Keeping a food diary and using a body fat calculator can help you stay on track when it comes to losing weight, but one visit to your local fast food restaurant can wreak havoc on your calorie counting. Portion control is important in any weight loss diet. However, portions are often out of control when it comes to eating fast food. With many fast food meals weighing in at nearly eight times larger than the recommended serving size, those calories can quickly add up. Many restaurants have begun to offer more options to those health conscious dieters who still need to eat on the go. With the introduction of salads, low-fat dressings, and fruits, you can eat quickly and still be healthy. For many, though, fast food nutrition facts can be hard to understand. 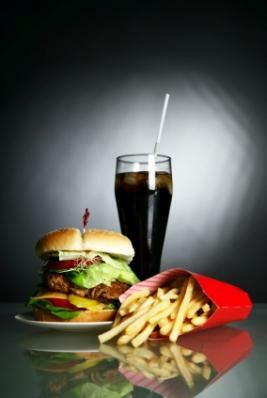 There are ways you can combat the extra weight that often is associated with fast food. Don't super-size-You'll find that nearly all fast food restaurants want to push their value meals, and with those meals often comes the option to super-size. While you might be getting more food for your money, do you really need it? Of course not, so don't fall for those advertising ploys! Don't clean your plate!-Here again, many consumers are worried about wastefulness, and while we may hear our mother's admonishing words about starving children in other countries, we need to take care of our bodies. Even the smallest value meal is generally too much food. Don't eat that last fry if you can help it. Skip the value meal-Don't order that value meal at all. Stick with the sandwich, skip the mayo, and drink water. If you must have a soft drink, make it a diet one! Did you know that the difference between a small order of fries and a super-sized one can be as much as 400 calories? Take this thought a little farther, though. Did you know that a small fry order is generally 210 calories? Do you really need to eat those fries? Salads-Restaurants are getting more and more creative with their salad choices. They may offer grilled chicken, fruit salad, Asian salads, and more. They typically have low-fat and fat-free dressings available upon request as well. Grilled sandwiches-Order that sandwich without mayo, or ask for the mayo and other condiments on the side so you have control of how much goes on your sandwich. If whole wheat bread is available, grab it as well. Baked potato-Be careful here. If you order a baked potato and then stuff it with tons of butter, sour cream, and cheese, you are defeating your purpose of a healthy meal! Pizza-That's right, pizza! Not just any pizza, however. Skip the extra cheese, and ask for thin crust. Oh, and don't eat too many pieces! Where do you go to look for fast food nutrition facts? Since many restaurants obviously don't advertise how fattening many of their foods are, you may be at a loss to find this information. Some diets, such as Weight Watchers often distribute material that lists specific restaurants along with their menus. You can see exactly how many calories and/or points (if you are on a point system) that grilled chicken salad is. If you don't have access to this information, though, there are numerous websites that offer nutrition facts. Most of these are easy to use as well, and you can typically do a search by restaurant, food category, and specific food item. So, before you head to your nearest fast food drive-through, check them out!